Do I need to purchase a new refrigerator? You may have to purchase a new refrigerator if there are issues that cannot be fixed on it. In most cases a refrigerator is easily repairable. Just like with a car refrigerators have several parts that can break down over time. They also need routine maintenance. If your refrigerator is having an issue call us ernest know what symptoms it is experiencing. There we can give you an estimate on how much this repair will cost. ​If you decide that you would rather purchase a new refrigerator rather than spending money on repairs it is up to you. Some refrigerators May cost thousands of dollars to replace While others may be cheaper. Depending on your brand and the make and model as well as how older refrigerator is you may be able to repair the fridge for a very low cost which would be much more budget-friendly purchasing a brand new refrigerator from the home appliance store. What parts break most often on a fridge? Since there are many parts in a refrigerator there are also many parts that can break. One of the most frequent calls we get for refrigerator repairs are for the fan motor and cooling motor. Also the ice maker and water maker tend to break quite often since they got used very frequently. The door on the refrigerator is a spot that can break easily as well if the family members are not careful to close the refrigerator gently each time. Sometimes children may swing on the doors or open them too far which can cause a lot of wear and tear over time. Shelves are also an area that made break easily due to over loading or putting heavy pots and pans inside of the fridge rather than Tupperware, which is made out of softer plastic. ​Of course this can depend on certain brands. Some brands are more durable than other brands. Also certain brands tend to break in certain areas more often than other brands. After being in the appliance repair industry for many years, we have grown accustomed to working on appliances and we know which areas of which appliances are more likely to break than others. How much is a typical fridge repair? A repair on a refrigerator can range from $120 and up. This price will depend on several factors. 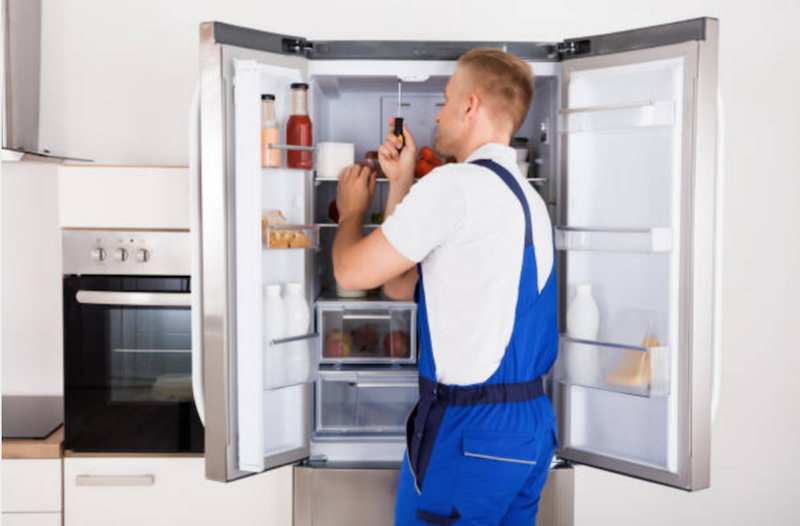 The best way to get an accurate quote is to contact us via phone and explain the issue you are experiencing with your fridge. Call us now or fill out our contact form! Are there fridge maintenance steps I can take? Never open the door roughly, or shut it roughly. Always make sure the door is sealed tightly, for both the fridge and freezer doors. Inspect ice levels periodically to insure the ice is not overflowing or not producing ice. Clean water dispenser area regularly to prevent mildew build up. Don't load too many heavy food or drinks on the shelves. Avoid putting hot leftovers in the fridge, let them cool first. Don't leave the doors open for too long, this will wear down the motor. What do I do if my fridge is leaking? A leaking fridge can mean many different things. Your best bet is to call our repair specialists. We will be able to troubleshoot with you over the phone and diagnose the issue more quickly. Did you know that if you are able to help us diagnose an issue with your fridge or other appliance we will over you a $25 discount on the repair? Call now!